A beautiful seating solution for any garden! Club Price: £422.99 - Save: £47.00 Join Today! A new addition to the elegant Emily Range, the Emily Corner Bench combines modern design with expert craftsmanship to create an ideal space to relax with family and friends. Perfectly designed to coordinate with the Emily Coffee Table or Bench. 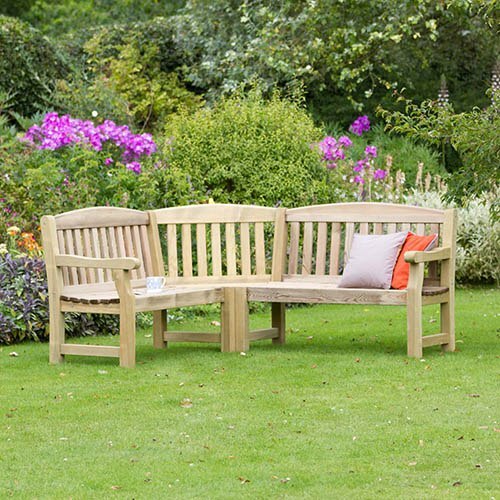 The Emily Corner Bench is manufactured from high quality, pressure treated, FSC® Certified timber to last longer, and comes with 10-year guarantee against rot so you can be sure that this product will last and remain to be a beautiful feature in your garden. Dimensions: 1.86m x 1.86m x 0.430m, assembly required - This product is 2-person assembly.